The most necessary and quick-responded functions of the Wall Pad functions. 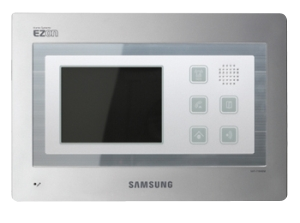 -The Samsung Sub Phone (SHT-7104) can check the door bell ringing from the outside, make a call to the security office in emergency, and perform an emergency alarm function. -SHT-7104 distinctively performs the most necessary and quick-responded functions of the Wall Pad functions.